A quick pasta that is also amongst the simplest of recipes, this Cheesy Pasta Arrabbiata is so easy to make, it is sure to become your fallback meal when time is limited. Although 'arrabbiata' literally means 'angry' in Italian, referring to the heat of the red chilli peppers used to make traditional arrabbiata sauce, your little one's tummies will be anything but. This recipe has been adapted to be friendly for tiny taste buds, including added cheese appeal. For more adventurous children (over 18 months), a pinch of chilli powder may be optionally added to introduce a hint of spice. 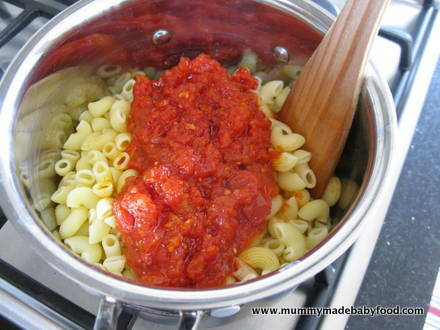 And for the quick pasta version, canned chopped tomatoes can be substituted for fresh ones. 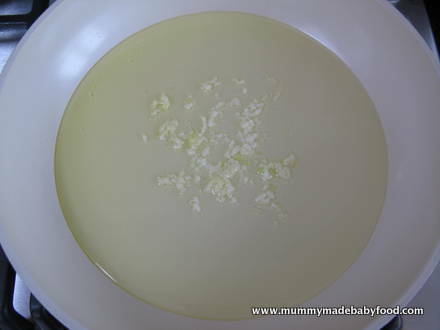 This is one of my go to recipes for meal time emergencies, as it is so easy to throw together using a few store cupboard items. Although arrabbiata sauce is traditionally paired with penne pasta, feel free to choose whatever pasta shapes your child prefers. 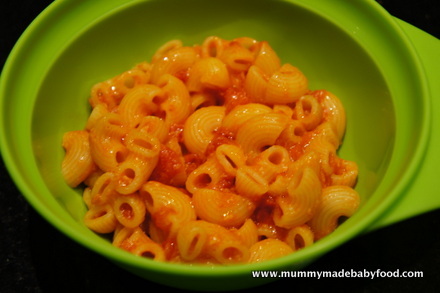 Smaller star or mini shell shapes may be more suitable for younger babies with smaller mouths, or try larger shapes that your baby can grip with his hands; similarly toddlers may prefer pasta with character shapes - follow your child's lead! This recipe yields 7-8 servings and is suitable for freezing. You could also make a large batch of the sauce to freeze for future use, and cook only the amount of pasta you need, just before serving. Heat the oil in a frying pan. Add the garlic, and let it sizzle for 1 minute to soften, being careful not to let it burn. 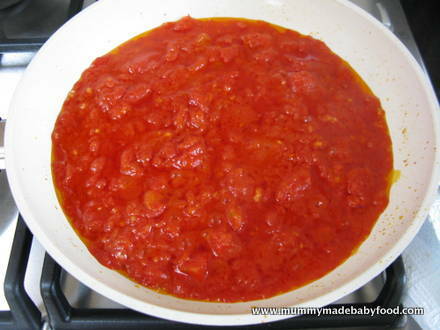 Stir in the tomatoes and chilli powder (if using), bring to a gentle boil, lower heat and simmer for 15 minutes, stirring occasionally. Meanwhile, cook the pasta according to the instructions on the packet. Time the pasta to finish cooking at the same time as the sauce. Drain the pasta and return it to the pot. Poor the tomato sauce over the pasta, and mix well. Add the Parmesan, and stir well until fully incorporated. Allow it to cool sufficiently before serving.